Note: Afterwards can also be performed separately, in a version for solo piano, with speaker reciting Thomas Hardy’s poem. Piano score by Paul Mann in preparation. The Suite To Notice Such Things is written in memory of Sir John Mortimer, CBE, QC, a man of immense good humour and love of life; a charismatic, mould-breaking barrister, a novelist and playwright and the creator of Rumpole of the Bailey. He was also a very dear friend. We met in the late 1990s, and a couple of years later he asked me if I might enjoyplaying the piano for some of his shows. Entitled Mortimer’s Miscellany, these were evenings in the theatre, full of poetry and prose, observation and anecdote, during which, seated in the company of two actresses, a pianist and a flutist, he mused his way through his amiable yet trenchant look at life, love and the law and succeeded in illuminating all three with deep love, rollicking humour, and of course a few tears. Over the years he had done scores of these performances, with enormous success and without any help from me, and I was therefore charmed and thrilled to accept. Especially as he asked, in that lovely, light and slightly diffident tenor voice of his, if I would also consider writing a couple of pieces to accompany the show. So… I wrote curtain up pieces for Acts One and Two, and a piece to close the evening, amongst a few other odds and ends, and then spent the next half a dozen years playing, on and off, for John, with his bevy of wonderful actresses, and Clive Conway on the flute, all over the UK. The last show we did together, in Cerne Abbas, Dorset, in the late summer of 2008, with John quite frail and tremulous, but still funny and touching, will stay in my mind and in my heart forever. He passed away a few months later, on January 16th 2009. Towards the end of February, I was approached by Andrew Bernardi, artistic director of the Shipley Arts Festival, with the offer of a commission to write a piece for solo flute and string orchestra to be performed in July. At first, daunted by the fairly short time-frame, I demurred. Then I thought of my John pieces for flute and piano and, still dealing with the loss of my friend, thought that perhaps they might be the basis for a new piece, and that I could write it in his memory. I wanted to give the flute the job of ‘speaking’ for John throughout the Suite; his laughter and his sighs, his wistfulness and occasional mild cantankerousness, his playfulness, and also the anguish and then the acceptance of his final days. So those odds and ends became the genesis of this Suite, and I hope they make this a very personal voyage around Sir John Mortimer. The crowds upon the pavement were fields of harvest wheat. The clocks had ceased their chiming and the deep river ran on. Now John is in his glory: the late 1960s, the 70s, and the early 80s, when he bestrode the Strand and the law courts, and the OId Bailey like a hilarious, brilliant, and cutting colossus, resolutely defending the right of free speech, but with a quick wit and quietly devastating humour and pure joy in his love of debate. I remember him telling me once, when we heard it on the radio, that Bach’s Brandenburg Concerto No.3 had always sounded to him like London music, so it makes a couple of brief (sorry) appearances here. The ghost of Horace Rumpole also flickers gently near the end. John was also an inveterate admirer of the female of the species, so he is heard here a-courting too. This is the music that began Act 2 of Mortimer’s Miscellany. John grew up, worked, and lived his life in the house that his father built in Turville in the Chilterns, and here I imagined him walking round the garden that his father loved, and that he loved too, smiling and humming quietly to himself, murmuring ideas, remembering, and then wandering thoughtfully back towards the house. Nostalgic yes – but it ends with a wink. We are now in the later years. John’s legs became less and less reliable and he took to using a stick and then a wheelchair. But here Sir John dances. He hauls himself to his feet, muttering incantations, and with one hand on his trusty walking stick, the other holding the hand of a compliant young lady who does all the jiving, he smiles and enjoys the view. 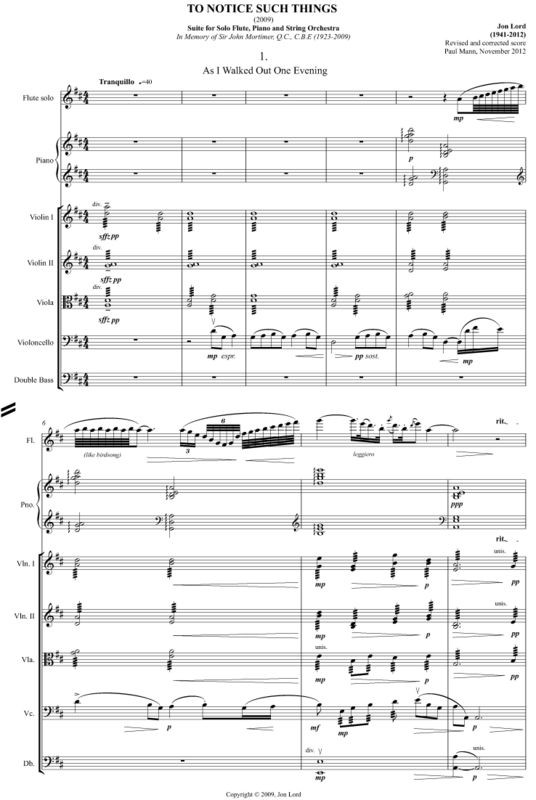 The Sir John in Lovemusic from the second movement makes a triumphant return but eventually, and reluctantly, he has to be seated again, and the music subsides. A final flourish, then a quiet sad smile at the passing of time. A picture of his last winter. A hard enough time for those who knew and loved him, but for John himself – one hardly dare imagine. Here the flute becomes his voice; sighing, crying, pleading, and maybe screaming out in frustration and loss. Then comes peace and the beginning of the end of a journey. The title is that of the poem by Thomas Hardy, with which Mortimer’s Miscellany ended, while Clive and I played quietly in the background and the poem cast its bitter-sweet spell. I have expanded that music into this farewell and au revoir to my dear friend. John used to close his show by saying that he would be reading the poem in memory of his father, or perhaps as an epitaph for himself, but certainly, he said, for all those who spend their best days in the country and notice the things that matter. Even if on the surface it may have seemed a little unexpected, the friendship between Jon and Sir John was something very special. They were soul-mates, and as with all great friendships, their deeper affinities were always more important than any superficial dissimilarities. This work shows just how profound those sentiments were; all the more so since – rarely for Jon – it was composed so quickly. On the two occasions that Jon and I performed this piece together we made many small changes to the score, and a couple of more major ones – including the eliding of the fourth and fifth movements, which are now joined to one another without a break. I had also suggested to Jon that he might incorporate more detail into the notation of the flute cadenza that forms the greater part of Winter of a Dormouse. His response to this was not, as I had imagined, a greater profusion of dynamic and articulation marks, but the addition of various lines from Dylan Thomas’ poem Do Not Go Gentle Into That Good Night which it seemed to him (and to me) gave the flute soloist all the information he needed. 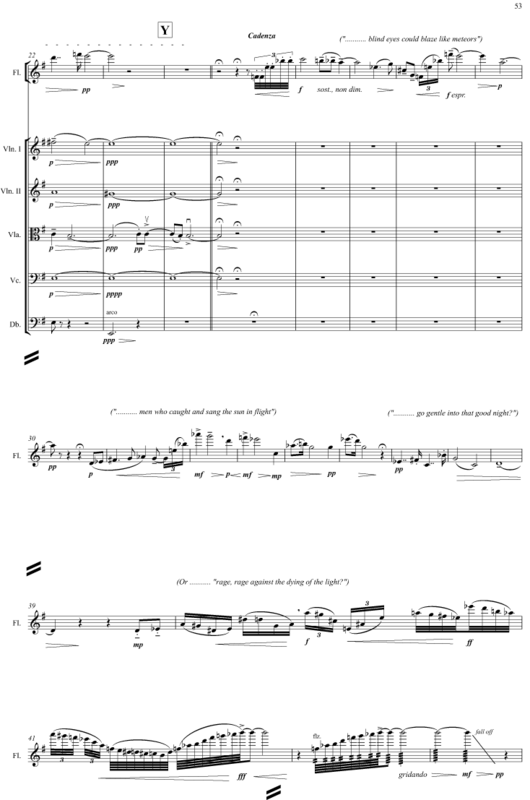 All this is included in the new score for the first time.